For other uses, see Armorica (disambiguation). Not to be confused with Americas or America. The Roman geographical area of Armorica. The Seine and the Loire are marked in red. Armorica or Aremorica is the name given in ancient times to the part of Gaul between the Seine and the Loire that includes the Brittany Peninsula, extending inland to an indeterminate point and down the Atlantic Coast. The toponym is based on the Gaulish phrase are-mori "on/at [the] sea", made into the Gaulish place name Aremorica (*are-mor-ika) "Place by the Sea". The suffix -ika was first used to create adjectival forms and then names (see regions such as Pays d'Ouche from Utica and Perche from Pertica). The original designation was vague, including a large part of what became Normandy in the 10th century and, in some interpretations, the whole of the coast down to the Garonne. Later, the term became restricted to Brittany. In Breton, which belongs to the Brythonic branch of the Insular Celtic languages, along with Welsh and Cornish, "on [the] sea" is war vor (Welsh ar fôr, "f" being voiced and pronounced like English "v"), but the older form arvor is used to refer to the coastal regions of Brittany, in contrast to argoad (ar "on/at", coad "forest" [Welsh ar goed or coed "trees"]) for the inland regions. The cognate modern usages suggest that the Romans first contacted coastal people in the inland region and assumed that the regional name Aremorica referred to the whole area, both coastal and inland. Map of Briton settlements in the 6th-century, including what became Brittany and Britonia (in Spain). Pliny the Elder, in his Natural History (4.17.105), claims that Armorica was the older name for Aquitania and states Armorica's southern boundary extended to the Pyrenees. Taking into account the Gaulish origin of the name, that is perfectly correct and logical, as Aremorica is not a country name but a word that describes a type of geographical region, one that is by the sea. Pliny lists the following Celtic tribes as living in the area: the Aedui and Carnuteni as having treaties with Rome; the Meldi and Secusiani as having some measure of independence; and the Boii, Senones, Aulerci (both the Eburovices and Cenomani), the Parisii, Tricasses, Andicavi, Viducasses, Bodiocasses, Veneti, Coriosvelites, Diablinti, Rhedones, Turones, and the Atseui. Trade between Armorica and Britain, described by Diodorus Siculus and implied by Pliny was long-established. Because, even after the campaign of Publius Crassus in 57 BC, continued resistance to Roman rule in Armorica was still being supported by Celtic aristocrats in Britain, Julius Caesar led two invasions of Britain in 55 and 54 in response. Some hint of the complicated cultural web that bound Armorica and the Britanniae (the "Britains" of Pliny) is given by Caesar when he describes Diviciacus of the Suessiones, as "the most powerful ruler in the whole of Gaul, who had control not only over a large area of this region but also of Britain" Archaeological sites along the south coast of England, notably at Hengistbury Head, show connections with Armorica as far east as the Solent. This 'prehistoric' connection of Cornwall and Brittany set the stage for the link that continued into the medieval era. Still farther East, however, the typical Continental connections of the Britannic coast were with the lower Seine valley instead. Archaeology has not yet been as enlightening in Iron-Age Armorica as the coinage, which has been surveyed by Philip de Jersey. 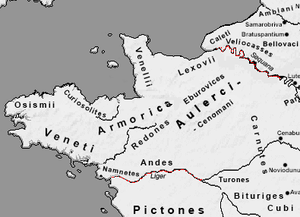 Under the Roman Empire, Armorica was administered as part of the province of Gallia Lugdunensis, which had its capital in Lugdunum, (modern day Lyon). When the Roman provinces were reorganized in the 4th century, Armorica (Tractus Armoricanus et Nervicanus) was placed under the second and third divisions of Lugdunensis. After the legions retreated from Britannia (407) the local elite there expelled the civilian magistrates in the following year; Armorica too rebelled in the 430s and again in the 440s, throwing out the ruling officials, as the Romano-Britons had done. At the Battle of the Catalaunian Plains in 451 a Roman coalition led by General Flavius Aetius and the Visigothic King Theodoric I clashed violently with the Hunnic alliance commanded by King Attila the Hun. Jordanes lists Aëtius' allies as including Armoricans and other Celtic or German tribes (Getica 36.191). The "Armorican" peninsula came to be settled with Britons from Britain during the poorly documented period of the 5th-7th centuries. Even in distant Byzantium Procopius heard tales of migrations to the Frankish mainland from the island, largely legendary for him, of Brittia. These settlers, whether refugees or not, made the presence felt of their coherent groups in the naming of the westernmost, Atlantic-facing provinces of Armorica, Cornouaille ("Cornwall") and Domnonea ("Devon"). These settlements are associated with leaders like Saints Samson of Dol and Pol Aurelian, among the "founder saints" of Brittany. According to C.E.V. Nixon, the collapse of Roman power and the depredations of the Visigoths led Armorica to act "like a magnet to peasants, coloni, slaves and the hard-pressed" who deserted other Roman territories, further weakening them. Vikings settled in the Cotentin peninsula and the lower Seine around Rouen in the ninth and early tenth centuries, and these regions came to be known as Normandy, the name Armorica fell out of use in the area. With western Armorica having already evolved into Brittany, the east was recast from a Frankish viewpoint as the Breton March under a Frankish marquis. The home village of the fictional comic-book hero Asterix was located in Armorica during the Roman Republic; there, "indomitable Gauls" hold out against Rome. The unnamed village was reported as having been discovered by archaeologists in a spoof article in the British The Independent newspaper on April Fool's Day in 1993. North Armorica is mentioned in the first sentence of James Joyce's novel Finnegans Wake. Armorica is featured extensively in Bernard Cornwell's novel The Winter King, where Ynys Trebes, later Mont Saint Michel, is besieged and destroyed by the Franks. In The Farfarers: Before the Norse, Farley Mowat speculated that Armorica was the origin of the Albans, who fled from Romans to Britain and Orkney and later fled from Norse, discovering Iceland, Greenland, Ungava Peninsula, Quebec and Newfoundland. The protagonist, Mathurin Kerbouchard, of Louis L'Amour's The Walking Drum is a native of Brittany and extensively references the culture of Armorica in the 12th century. Armorica is the home country of Felix in Juliet Marillier's "Seer of Sevenwaters", the 5th book in the Sevenwaters series. ^ Merriam-Webster Dictionary, s.v. "Aremorica"; The Free Dictionary, s.v. "Aremorica". ^ The Irish form is ar mhuir, the Manx is er vooir and the Scottish form air mhuir. However, in those languages, the phrase means "on the sea", as opposed to ar thír or ar thalamh/ar thalúin (er heer/er haloo, air thìr/air thalamh) "on the land". ^ Caesar, De Bello Gallico ii.4. ^ Leon Fleuriot's primarily linguistic researches in Les Origines de la Bretagne, emphasizes instead the broader influx of Britons into Roman Gaul that preceded the fifth-century collapse of Roman power. ^ Procopius, in History of the Wars, viii, 20, 6-14. ^ K. Jackson, Language and History in Early Britain Edinburgh, 1953:14f. ^ Keys, David (1 April 1993). "Asterix's home village is uncovered in France: Archaeological dig reveals fortified Iron Age settlement on 10-acre site". The Independent. Retrieved 17 April 2015. ^ Mowat, Farley. The Farfarers: Before the Norse. Key Porter Books, Limited. ISBN 978-1-883642-56-3. Wikisource has the text of the 1911 Encyclopædia Britannica article Armorica. Breton is a member of the Brittonic Southwestern Brittonic branch of the Celtic languages spoken in Brittany. Magnus Maximus was Roman Emperor in the western portion of the Empire from 383 to 388. Dumnonia is the Latinised name for the Brythonic kingdom in Sub-Roman Britain between the late 4th and late 8th centuries, in what is now the more westerly parts of South West England. 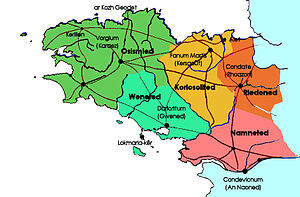 It was centred in the area later called Devon, but included modern Cornwall and part of Somerset, with its eastern boundary changing over time as the gradual westward expansion of the neighbouring Anglo-Saxon kingdom of Wessex encroached on its territory. The spelling Damnonia is sometimes encountered, but is also used for the land of the Damnonii, later part of the Kingdom of Strathclyde, in what is today southern Scotland. Domnonia also occurs and shares a linguistic relationship with the Breton region of Domnonée, Breton: Domnonea. Gallo is a regional language of France. It is not as commonly spoken as it once was, as the standard form of French now predominates. Gallo is classified as one of the Oïl languages. The historicity of King Arthur is a source of considerable debate among historians, some of whom have suggested that Arthur was a mythological or folkloric figure. Arthur first appears in historical context as a leader fighting against the invading Saxons in 5th- to 6th-century Sub-Roman Britain at the Battle of Badon in a text written more than three centuries after his activity. He develops into a legendary figure in the Matter of Britain from the 12th century, following Geoffrey of Monmouth's influential Historia Regum Britanniae. Cornouaille is a historic region of Brittany in northwestern France. The name is cognate with Cornwall in neighbouring Great Britain. This can be explained by settlement of Cornouaille by migrant princes from Cornwall creating an independent principality founded by Rivelen Mor Marthou, and the founding of the Bishopric of Cornouaille by ancient saints from Cornwall. The two regions spoke a similar Brythonic language, which evolved into Cornish in Cornwall and the closely related Breton across the English Channel in Brittany; the two languages are more remotely related to Welsh. Pan-Celticism, also known as Celticism or Celtic nationalism is a political, social and cultural movement advocating solidarity and cooperation between Celtic nations and the modern Celts in North-Western Europe. 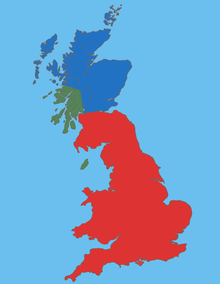 Some pan-Celtic organisations advocate the Celtic nations seceding from the United Kingdom and France and forming their own separate federal state together, while others simply advocate very close cooperation between independent sovereign Celtic nations, in the form of Irish nationalism, Scottish nationalism, Welsh nationalism, Breton nationalism, Cornish nationalism and Manx nationalism. Breton mythology is the mythology or corpus of explanatory and heroic tales originating in Brittany. The Bretons are the descendants of insular Britons who settled in Brittany from at least the third century. 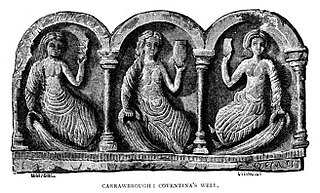 While the Britons were already Christianised in this era, the migrant population maintained an ancient Celtic mythos, similar to those of Wales and Cornwall. Gwened, Bro-Gwened or Vannetais is a historic realm and county of Brittany in France. It is considered part of Lower Brittany. Celtic coinage was minted by the Celts from the late 4th century BC to the late 1st century BC. Celtic coins were influenced by trade with and the supply of mercenaries to the Greeks, and initially copied Greek designs, especially Macedonian coins from the time of Philip II of Macedon and his son, Alexander the Great. Thus Greek motifs and even letters can be found on various Celtic coins, especially those of southern France. 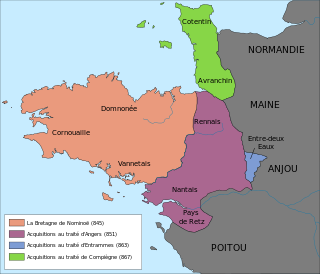 The Kingdom of Brittany was a short-lived vassal-state of the Frankish Empire that emerged during the Norman invasions. Its history begins in 851 with Erispoe's claim to kingship. In 856, Erispoe was murdered and succeeded by his cousin Salomon. The kingdom fell into a period of turmoil caused by Norman invasions and a succession dispute between Solomon's murderers: Gurvand and Pascweten. Pascweten's brother, Alan, called the Great, was the third and last to be recognized as king of Brittany. After his death, Brittany fell under Norman occupation. When Alan Twistedbeard, Alan the Great's grandson, reconquered Brittany in 939, Brittany became a duchy until its union with France in 1532.